Bison Plains is situated on more than 40 acres of land, half of which is woodland and hills and the other, flat, open grasslands. American Bison are the largest terrestrial and heaviest land animals in North America. Bison, known for living in the Great Plains, were hunted close to extinction during the 19th and 20thcenturies. But, have since recovered in population and are no longer listed as endangered. American Bison are commonly mistaken for buffalo, but the two have different physical characteristics, habitats, temperaments and life spans. Buffalo are found in Africa and south Asia while bison roam North and South America. Bison can stand five to six-and-a-half feet tall at the shoulder and can weigh over 2,000 pounds. Despite their massive size, bison are quick and able to run up to 40 miles an hour. They also have a fairly simple diet: grass, low-lying shrubbery and twigs. 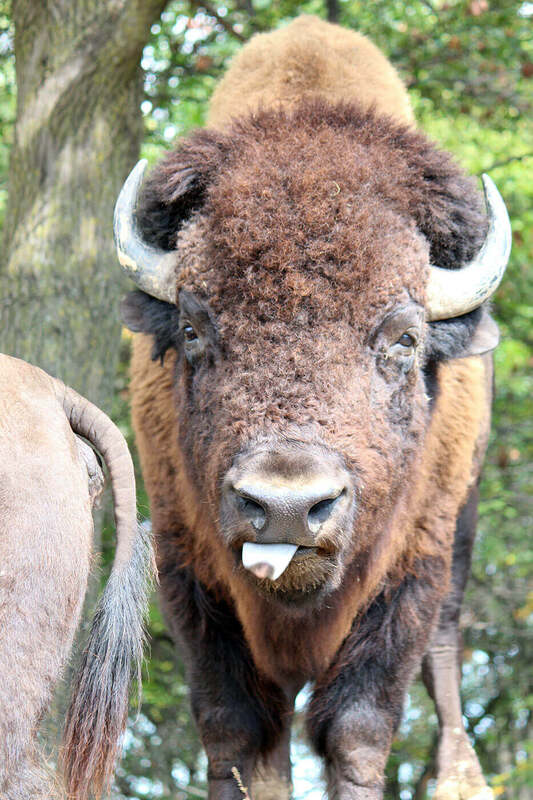 Fun Fact: At night, the bison herd is let off of the main pasture to an off-exhibit holding pasture. The movement helps prevent wear and tear on their daytime area.